Sy Devore is giving a 20% discount storewide this weekend, plus an extra 10% with My Daily Find. Sy Devore: This legendary Studio City store named after the man who was the “tailor to the stars” — who clothed the Rat Pack and still dresses the Hollywood elite — is celebrating Thanksgiving weekend and Small Business Saturday with giving a 20% discount on everything in the store today through Sunday. Get an additional 10% discount with My Daily Find. Harrisons has gifts for home and body, including this fine jewelry ring made of Rose Gold, Diamonds, and Amazonite, as well as these sparkly CZ necklaces. Use Amex and get $25 credit, plus get a 10% discount with My Daily Find! Harrisons: Shop this Saturday, November 24th at this very special Tarzana store for Small Business Saturday. If you use an American Express Card to pay, you will receive a $25 credit on your bill. Mention My Daily Find, and receive an extra 10% discount! Harrisons is an elegant gift store featuring an upscale selection of gifts, housewares and fine and fashion jewelry with name artists and designers. 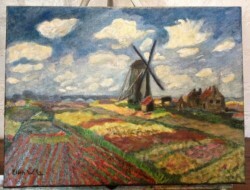 Art classes for all levels and ages at Pastime for Lifetime. Buy four classes and get a drawing class free! It’s a great gift! 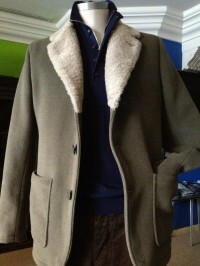 Eissa Vintage trunk show at No Roses this Saturday…25% off for one day only. Jewelry Trunk Show: No Roses Gallery in Sherman Oaks is featuring Mary Ann Eissa’s retro-inspired collection, Eissa Vintage, in a trunk show on November 24 from 11 a.m. to 5 p.m This Saturday, she’s introducing an all-new, bold and rustic collection called Industrial Chic. 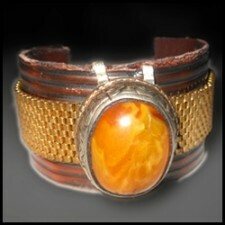 Cuff bracelets and earrings will be 25% off for one day only. These are all one-of-a-kind designs. There will also be refreshments from Portos Pastries. 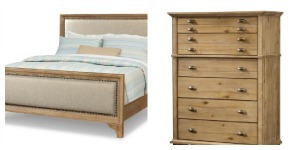 There’s outrageous deals at Hotel Surplus Outlet’s 30,000 square foot warehouse, including this Klaussner South Bay Chest and Bed made of Rustic Acacia Wood. Hotel Surplus Outlet: One of My Daily Find’s longest running faves in Van Nuys is having an amazing Thanksgiving sale all weekend long on top of their already incredible discounts up to 80% off!. Check out special factory close outs, promotions and package deals on a wide range of furniture and accessories, including NEW inventory straight from the manufacturers. If there is something you want, but don’t see it, just ask. Large upholstered lounge chairs starting at $100; sleepers starting at $149; night stands, side tables and coffee tables starting at $50 ; framed art work starting at $10; lamps starting at $10; brand new bonded leather sectionals at $799.95 (reg. $1200); desks, dressers starting at $250; black otomans at $150 each. You actually have to visit the 30,000 square foot warehouse to see everything they carry. Gertie’s & BB’s: Get a 15% discount on all orders made by November 30. 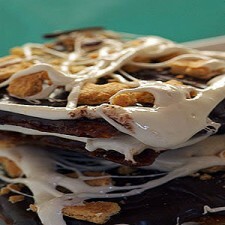 Gertie & BB’s Gourmet Goodies: It’s MDF’s fave toffee candy. Orders placed before November 30 for delivery any time through December 20 qualify for a 15% discount. Go to www.gertieandbb.com, indicate your preferred delivery date, and enter SMALLBIZ12 at checkout to receive your discount. Gift cards, gift wrapping and shipping your gifts for you. Big discounts and gifts at Ferrari Olive Oil. 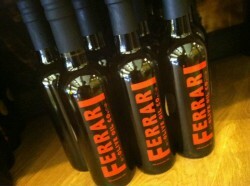 Ferrari Olive Oil: Celebrate Black Friday at this Studio City gourmet shop with 50% off select oils and vinegars. All others are 25% off. These gourmet olive oils and vinegars make great gifts and are a perfect addition to all your home cooked meals! 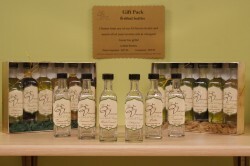 Doors open at 9 a.m.
Olive oil, vinegar and gourmet gift packs at Olive Vineyard. Olive Vineyard: This Agoura Hills gourmet shop is having a Thanksgiving weekend deal. On Friday, November 23, purchase two two 375ml bottles of olive oil or vinegar for $30. Come back on Saturday or Sunday and get two gift packs for $50. Click here for the coupons. HOLIDAY VOLUNTEER OPPORTUNITIES: THE BIG SUNDAY HOLIDAY LIST: This community service organization has nearly 125 different ways for you to help this year ranging from providing meals, giving gifts to homeless kids at Christmas, hosting a food drive with your office, school or faith group, singing to seniors on Hanukkah or shopping at a holiday bazaar to benefit people in need. The list is updated weekly and has volunteer opportunities for all ages. Winter Wonderland Pasadena: Old Pasadena comes alive with holiday festivities throughout the district, Friday, November 23 from 4 p.m. to 8 p.m. Enjoy live music, live reindeer, 20 tons of real snow, a magical tree-lighting ceremony, kids crafts, Santa’s arrival at 6.p.m. and much more- guaranteed to start your holidays with joy, and lots of fun! All activities are family friendly, free, and open to the public. Everything kicks off at 4 p.m. with Old Pasadena’s own winter wonderland, located on Holly Street between Raymond and Fair Oaks. At the Tree-Lighting, everyone is asked to bring an unwrapped toy or book for the Charles Cherniss Tournament Toys toy Drive. SFV Walking Tour: Join the Museum of the San Fernando Valley for a stroll back in time through the “Town That Was Started Right!” tour on Saturday from 10 a.m. – 12:30 p.m. This “Walk it Off” tour include: Van Nuys Bungalow Women’s Club Old Van Nuys Library (1927) United Methodist Church Municipal Building Façade Van Nuys Post Office Abeles Map Fernando Statue, Crystal Plunge Mentions of Bob’s Big Boy, Busch Gardens Lankershim, Van Nuys, Whitsett, Whitley RSVP: Call 818-347-9665 (Please leave name, address and phone number (walk-ups welcome too!) or email Richard Hilton, Chair of Historic Walking Tours/Special Events at events@TheMuseumSFV.org . Pay in advance by going to Museum website at www.theMuseumSFV.org, then click DONATE button in upper right hand corner of any web page. Attendees can pay via credit card or PayPal. Meet at Van Nuys City Hall – 6262 Van Nuys Blvd. – under arch at Marvin Braude Building . Topanga Vintage Market: No need to traipse out to Long Beach, Santa Monica or the Rose Bowl. This specialized monthly market features authentic vintage goods and collectibles with over 150 booths. Westfield is also offering special deals with WowPow passes up to 20% off at Macy’s, personal Wacoal lingerie fittings, and other fun perks! 8 a.m – 3 p.m. at the Westfield Promenade, and the fourth Sunday of every month (except December). Read the My Daily Find article here! American Idol’s Phillip Phillips Concert at The Americana at Brand: Go see American Idol winner Phillip Phillips perform live at The Americana at Brand. He will be performing new songs off his recently released album “The World from the Other Side of the Moon”. Two ways to meet Phillip Phillips directly following the show! Spend $500 dollars* on Black Friday, November 23, at The Americana at Brand to receive VIP Concert seating and a CD to be signed by Phillip Phillips after the show. Or, purchase his new CD on The Green at The Americana at Brand on November 25.While supplies last.While supplies last. Holidays at CityWalk: Conor Maynard and Megan Nicole will perform live at 6 p.m. for all ages. Conor Maynard, who was signed and produced by Ne-Yo, is often referred to as the “British Justin Bieber” and will now be at 5 Towers live for FREE! With over 1.2 million YouTube subscribers and signed to Wright Entertainment Group after meeting with Sean “Diddy” Combs, pop artist Megan Nicole will be opening the show. There’s a DJ dance party before the show starts and get your chance to win prizes! successful community leaders. The troop is sponsored by St. Francis De Sales Parish in Sherman Oaks.